This image shows a stack of layers on the floor of an impact crater roughly 30 kilometers across. Many of the layers appear to be extremely thin, and barely resolved. 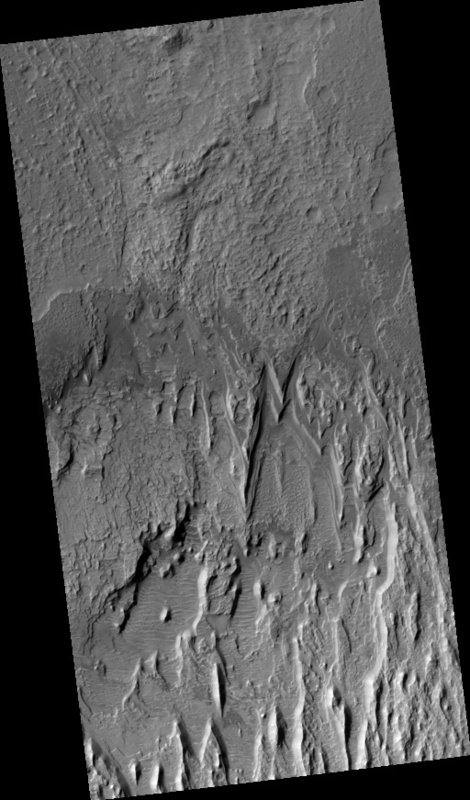 In broad view, it is clear that the deposit is eroding into a series of ridges, likely due to the wind. 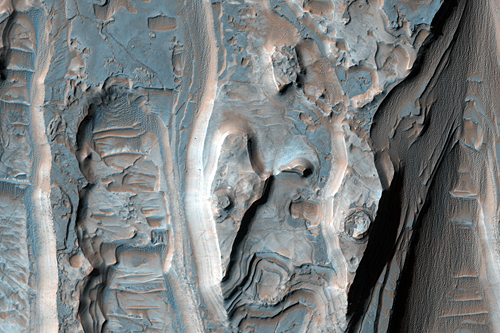 Below the ridges, additional dark-toned layered deposits crop out. These exhibit a variety of textures, some of which may be due to transport of material. The light ridges are often capped by thin dark layers, and similar layers are exposed on the flanks of the ridges. 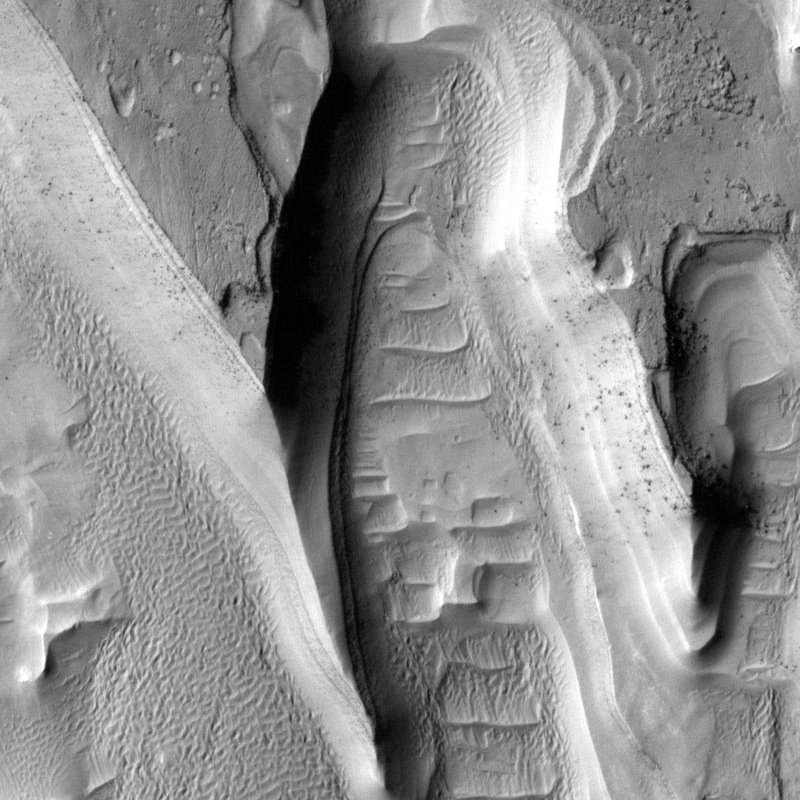 These layers are likely harder than the rest of the material, and so armor the surface against erosion. They are shedding boulders which roll down the slope, as shown in the subimage. Although these cap layers are relatively resistant, the boulders do not seem to accumulate at the base of the slope, so it is likely that they also disintegrate relatively quickly. The subimage itself is 250 meters wide. The light is from the left. Boulders are visible on the slopes of the ridges along with thin dark layers including the cap layer, but they are absent on the spurs where the resistant cover has been eroded. This demonstrates that the boulders come only from the dark layers, and are not embedded in the rest of the deposit. The Orion Nebula reveals many of its hidden secrets in a dramatic image taken by ESO’s new VISTA survey telescope. The telescope’s huge field of view can show the full splendour of the whole nebula and VISTA’s infrared vision also allows it to peer deeply into dusty regions that are normally hidden and expose the curious behaviour of the very active young stars buried there. The Orion Nebula is a vast stellar nursery lying about 1350 light-years from Earth. Although the nebula is spectacular when seen through an ordinary telescope, what can be seen using visible light is only a small part of a cloud of gas in which stars are forming. Most of the action is deeply embedded in dust clouds and to see what is really happening astronomers need to use telescopes with detectors sensitive to the longer wavelength radiation that can penetrate the dust. 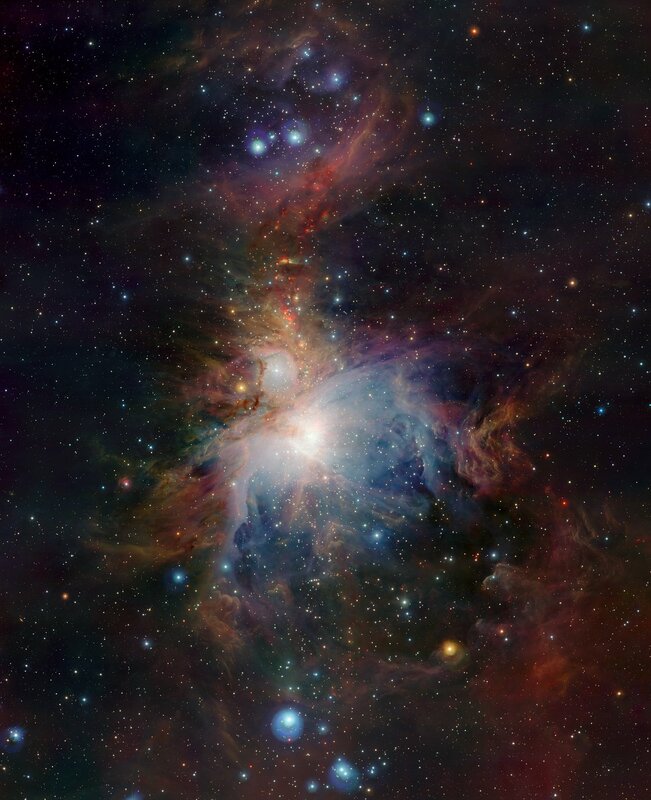 VISTA has imaged the Orion Nebula at wavelengths about twice as long as can be detected by the human eye. Hubble’s view isn’t sharp enough to see craters or mountains, if they exist on the surface, but Hubble reveals a complex-looking and variegated world with white, dark-orange, and charcoal-black terrain. The overall color is believed to be a result of ultraviolet radiation from the distant Sun breaking up methane that is present on Pluto’s surface, leaving behind a dark, molasses-colored, carbon-rich residue. The center disk (180 degrees) has a mysterious bright spot that is unusually rich in carbon monoxide frost. This region will be photographed in the highest possible detail when NASA’s New Horizons probe flies by Pluto in 2015. The Hubble images are a few pixels wide. But through a technique called dithering, multiple, slightly offset pictures can be combined through computer-image processing to synthesize a higher-resolution view than could be seen in a single exposure. This series of pictures took four years and 20 computers operating continuously and simultaneously to accomplish. 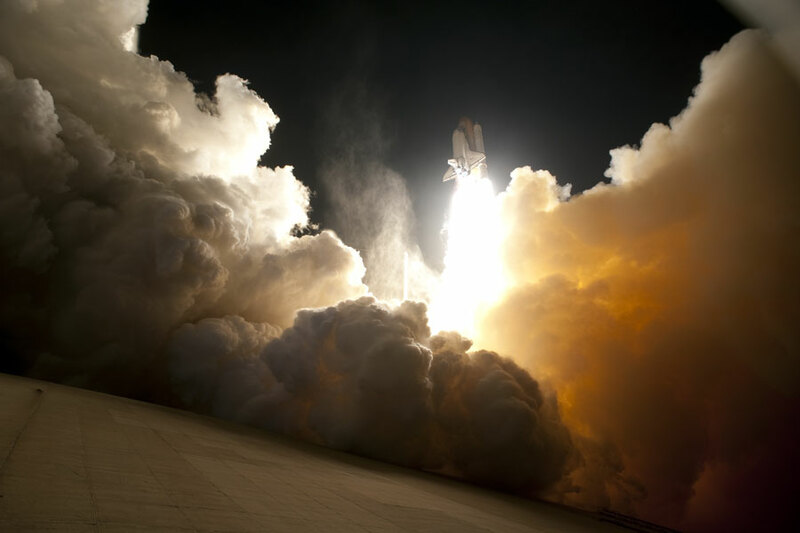 Sometimes, the space shuttle launches at night. Pictured above, the space shuttle Endeavour lifted off in yesterday’s early morning hours from Launch Pad 39A in Kennedy Space Center, Florida, USA, bound for the International Space Station (ISS). A night launch, useful for reaching the space station easily during some times of the year, frequently creates vivid launch imagery. The shuttle, as pictured above, is framed by an enormous but typical exhaust plume ejected as the shuttle’s powerful rockets began lifting the two million kilogram space bus into Earth orbit. Endeavour’s mission, labeled STS-130, includes the delivery of the Tranquility module to the space station. Tranquility will provide extra room for space station astronauts and includes a large circular set of windows designed to bestow vastly improved views of the Earth, the night sky, and the space station itself.